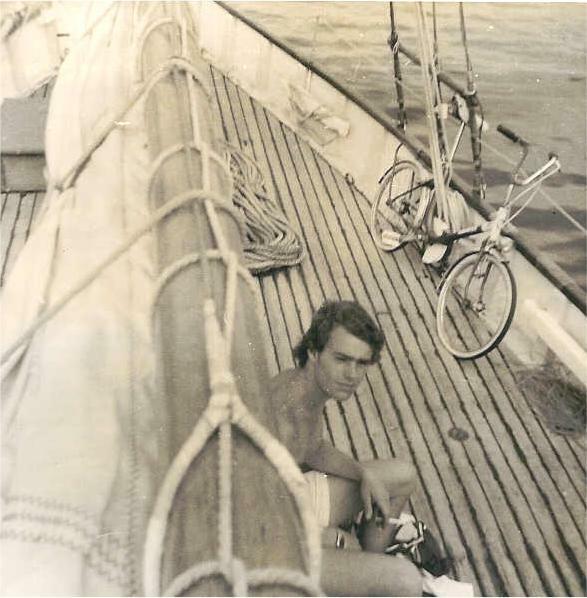 One summer I spent a month on our yacht ‘Voyageur’ sailing in the Mediterranean Sea. We berthed overnight in the port of Cagliari in Sardinia, and at six the next morning I prepared the boat to leave. A beautiful girl with shining brown eyes and long auburn hair stood alone on the quay. She smiled at me and blew me kisses with her hand, and I returned them with joy, but there was nothing I could do. I had already cast off and we were underway out through the swell at the harbour entrance. Her long hair flew wildly in the morning breeze and salt sprayed her from the waves; she ran along the quay, laughing and waving as she followed the boat out to the sea. There came a point where the sea-wall stopped on massive rocks at the mouth of the harbour and she couldn’t follow us any more. So she stood there in the wind outlined against the rising sun and smiled again; and my heart stopped for what seemed like eternity. After so many years I have never forgotten her. This is beautiful! What an enchanting moment, frozen in time. Thank you DD! It is a true story, so glad you enjoyed it! To be quite honest I nearly dived into the sea once we had passed the harbour-mouth but it was too rough that day. I have never forgotten the beautiful memory!